A handyman is skilled at a wide range of general maintenance and home repair jobs. These are typically small or odd jobs that don’t require a building permit. Individual states generally do not issue specific handyman licenses; however a handyman may be considered a contractor when the work is worth a certain amount of money or is part of larger jobs worth specific amounts. In these cases, a handyman may require a contractor license to perform the work or be subject to handyman license requirements. Make sure that if you plan to perform any plumbing, electrical or HVAC work that you check the licensing requirements as these are commonly not covered under the handyman or general contractor license requirements. Whether you’re just starting out as a handyman or you’ve been working for years and are planning to move, it’s important to know the licensing requirements of the state where you plan to set up. Each state has its own handyman license requirements, with some states issuing licenses at the local level. These regulations can seem complex, which is why we’ve put together this state-by-state guide for you. This comprehensive list of handyman license requirements, across all 50 states, is in alphabetical order so that the information you need is easy to find. If you click on the state name, you’ll be directed to the relevant government authority for licensing. If there’s no link, that means there are no requirements. Now you’ll be able to check that when combined with comprehensive handyman insurance, you’re in compliance with all the laws. Good luck! A handyman does not need a state license in Alabama, where contractors only require a license if the cost of their project is valued at more than $50,000. As of January 2015, a handyman in Alaska must hold a license to perform work worth up to $10,000. The General Contractor – Handyman license is issued by the Department of Commerce, Community and Economic Development, Division of Corporations Business and Professional Licensing. You must show proof of general liability and property damage insurance. Contractors who perform work worth over $1,000 must have a state license in Arizona. Commonly known as the handyman exemption, work that is worth less than $1,000 and is of a casual or minor nature does not carry handyman license requirements. However, even if the job has a value under $1,000, if it requires a building permit, the handyman exemption will not apply and a license will be required. The contractor’s license is issued by the Arizona Registrar of Contractors. To be eligible for a license, you’ll need to pass a trade, and business and law exam, and submit proof of a bond. You’ll need a Home Improvement License as a handyman in Arkansas, if you’re doing any type of construction, remodeling or repair work at a single-family residence, worth more than $2,000. There are two classes of licenses – limited (for jobs less than $50,000) and unlimited (for any size residential jobs). There is no exam, but you the handyman license requirements include proof of worker’s compensation insurance, as well as a financial statement. There is no specific handyman license in California; however, a handyman working on jobs worth more than $500 (even if your component is less than $500, but the overall job is worth more) must have a state license in California. If you work on a job that does not become a fixed part of the structure, such as hanging pictures or building furniture, you’ll be exempt from the $500 limit and can work on bigger projects. However, to cover all your options, you can get a general contractor’s license from the California Contractors State License Board. To be eligible for the license, you’ll need to show four years of work experience, show proof of insurance, and a contractor’s bond of $15,000. You’ll need to pass the trade, and business and law exam. As a handyman, you fall under the category of general contractors in Colorado. There are no state handyman license requirements for general contractors, although there are some local requirements that you need to check before you begin work. 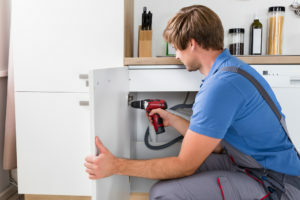 Handymen do not need a state license to work in Connecticut; however if you consider yourself a home improvement contractor who creates permanent changes to a residential property, you’ll need to register with the Department of Consumer Protection. General contractors in Delaware require a business license for revenue purposes and must register with the state to work on projects worth more than $50,000. There is no specific handyman license. As a handyman in Florida, you don’t need a state license for miscellaneous non-structural work such as minor carpentry, door repairs, panelling, tile installation and window repair. Any structural work such as building, home renovations, and roofing work, however, will require a license. The license is issued by the Department of Business and Professional Regulation and will require you to show four years of experience, as well as liability and worker’s compensation insurance. You must pass an exam. A handyman who works on any projects worth more than $2,500 needs a Residential Basic Contractors license to work in Georgia. You will need to pass a trade exam, as well as a business and law exam. You’ll need pre-approval from the Georgia Board of Residential and General Contractors in order to write the exam. You must have two years of experience and must show proof of general liability and worker’s compensation insurance. Hawaii requires all handymen who work on jobs where the labor and material are worth more than $1,000 or which require a building permit, to hold a license. General building contractor licenses and specialty contractor licenses are issued by the Department of Commerce and Consumer Affairs Professional and Vocational Licensing. You’ll need to pass a trade exam, as well as a business and law exam, show four years of experience in the past ten years, and show proof of insurance. There are no contractor licensing requirements in Idaho. A handyman, however, cannot claim to be a contractor without registering with the Idaho Contractors Board. Handymen and general contractors don’t require a state license to work in Illinois. You may need to check local handyman license requirements before you can begin work. There are no licensing requirements for handymen or general contractors in Indiana; however, there may be regulations at a local level and you must check these before you begin work. Iowa does not require a handyman to hold a state license; however, if you do business in the state, making more than $2,000 per year, you must register as a contractor with the Iowa Division of Labor. As a handyman you won’t need to get a state license to work in Kansas; however, there are regulations for general contractors on a local level so make sure to check these before you begin work. Kentucky does not require handymen, or general contractors, to hold a state license; however, you must check the local handyman license requirements before you begin work. A handyman must hold a state license in Louisiana for home improvement projects or residential projects where the labor and materials cost more than $7,500. The residential license is issued by the Louisiana State Licensing Board for Contractors. You may need to pass a trade exam and a business and law exam in the subspecialty you’re planning to work in, and you’ll need to show proof of insurance. There is also home improvement registration required for projects valued between $7,500 and $75,000. Registration requires only proof of insurance. There are no general contractor or handyman license requirements, on a state level, in Maine. There may be local regulations you need to comply with, however, so make sure to check these out before you begin working. A handyman working in Maryland will need a Home Improvement license from the Department of Labor, Licensing and Regulation. According to the department website, this will cover additions or alterations, conversions, improvement, modernization, remodeling, repair or replacement of a residential building. You must show two years of experience in home improvement work and show a certificate of insurance. You must also pass an exam which includes a business and law component. A handyman who performs home improvement jobs and property repairs does not require a state license, but must have a home improvement contractor registration. There is no exam requirement, but you must pay a registration fee. If you perform any structural work, such as a renovation or larger building projects to existing homes, you’ll need a Construction Supervisor License. There are various licenses depending on the scope of the work you plan to perform (“restricted” licenses for work on one-to-two-family homes and “unrestricted” licenses for work on structures up to 35,000 cubic feet. You’ll need to show three years of experience and pass an exam to be eligible for a license. A handyman in Michigan does not require a specific handyman’s license to work in the state; however, there are many jobs that a handyman may do that you would require a license for, such as carpentry, laying concrete, painting or decorating, or tiling. These all require a Maintenance and Alteration Contractor License. To be eligible for the license, you’ll need to complete 60 hours of educational courses and pass an exam. If you’re a handyman in Minnesota and you make more than $15,000 per year by working on existing structures,, you’ll need a Residential Remodeler License. Contractors who build new structures require a Residential Building License. The license is issued by the Department of Labor and Industry. However, if you only provide services in one specialty skill area (excavation, masonry, carpentry, interior finishing, exterior finishing, drywall and plaster or general installation specialties), you do not need a license. To be eligible for a license, you’ll need to pass an exam and show proof of general liability and worker’s compensation insurance. A handyman does not require a license in Mississippi unless the residential remodeling job costs more than $10,000. In this case, you’ll need a Residential Remodeling license issued by the Mississippi Contractor Licensing Board. You’ll need to pass the residential trade exam, as well as the business and law exam, and show proof of general liability and worker’s compensation insurance. A handyman, along with general contractors, does not need a state license to work in Missouri. You must check the local handyman license requirements, however, as there may be regulations at the local level. General contractors, including handymen, are not required to hold a license to work in Montana; however, if you have employees, you will be required to register with the Department of Labor and Industry, Contractor Registration Unit. To register, you must show proof of worker’s compensation insurance. If you have no employees, you can register, but you’re not required to. You cannot perform any electrical work without a license. You can work as a handyman in Nebraska without a state license; however, you will need to register with the Nebraska Department of Labor. This requirement applies to all general contractors, subcontractors or people who perform construction, alterations, renovations, additions, installations or repairs. As a handyman, you will need a contractor license if you plan to do any work worth more than $1,000 or work that requires a building license. The handyman exemption applies to work worth less than this amount; however, it limits the services you can offer. To be eligible for a license, you’ll need to show four years of work experience as a journeyman, foreman, supervising employee or contractor. Up to three years of experience can be substituted for years of education at an approved college. You’ll need to pass a trade exam, as well as a business and law exam and you must show proof of insurance. Handymen do not require a state license to work in New Hampshire, which only licenses those who perform electrical, plumbing or asbestos abatement work. A handyman, known as a home improvement contractor, does not require a license to work in New Jersey, but is required to register with the New Jersey Division of Consumer Affairs. There are no state licensing requirements for handymen or general contractors in New York; however, there are laws and regulations at a local level. You must check these handyman license requirements with local government before you do any work. A handyman doesn’t require a state license in North Carolina, where licenses are only required if the projects being worked on are worth more than $30,000. If you are a subcontractor working under the supervision of a general contractor, you also don’t need a license. A handyman must have a contractor license to perform any jobs in North Dakota that are worth more than $4,000. The contractor license covers any construction, alteration or repairs to a property. It is awarded by the Secretary of State of North Dakota. There are four classes of licenses based on the size of the jobs you plan to work on. You don’t need a handyman license on the state level to work in Ohio, but there may be regulations at the local level so make sure to check these before you start work. As a handyman, you will not need a state license to work in Oklahoma on any renovation, remodeling, repair or construction work. Make sure to check with local governments to see if there are any regulations on the local level before you begin work. A handyman must hold a state license in Oregon in order to work on jobs that are worth more than $1,000. Anyone conducting construction activity that involves improvements to a property must have a contractor license issued by the Oregon Construction Contractors Board. You’ll need to pass pre-license training and pass a test, and show proof of general liability and worker’s compensation insurance. You do not need a state license to work as a handyman in Pennsylvania; however, if you do more than $5,000 worth of home improvement work per year, you must register with the Attorney General’s Office. As a handyman, you won’t need a license to work in Rhode Island, but as someone who works in home construction, alterations, remodeling or repairs to residential properties, you’ll need to register with the State of Rhode Island Contractors’ Registration and Licensing Board. A handyman, under the classification of Residential Specialty Contractor, does not need a license to work in South Carolina; however, you will need to register with the South Carolina Department of Labor, Licensing and Regulation. This allows you to work in carpentry, drywalling, wallpaper, painting, sidings, insulation, floor covering, masonry, concrete and roofing. Handymen do not need a state license to work in South Dakota; however, there may be handyman license requirements at the local level so make sure to check these before you begin work. A handyman in Tennessee is not required to hold a state license unless the job they are working on is worth more than $25,000. A home improvement license is required for remodeling jobs worth between $3,000 and $24,999. The licenses are awarded by the Department of Commerce and Insurance Board for Licensing Contractors. You’ll need to pass a trade exam and a business and law exam. You must also show proof of general liability and worker’s compensation insurance. There are no state handyman license requirements for handymen in Texas. However, local regulations may require you to be licensed or registered in order to work as a handyman. Utah requires a license for contractors who perform work that is worth more than $3,000. This is commonly known as the handyman exemption as any work done worth less than that amount does not require a license. If you perform work worth more than $3,000 you will require a contractor license issued by the Utah Division of Occupational and Professional Licensing. You’ll need to show two years of experience under a licensed contractor, and pass a trade exam as well as a business and law exam. You must show proof of general liability and worker’s compensation insurance. If you do work that is worth less than $3,000, but more than $1,000, you’ll need to file an affirmation of exemption and show proof that you have general liability and worker’s compensation insurance. You do not need a state license to work as a handyman in Vermont; however, there may be regulations at the local level that you need to check before you begin work. A handyman will need a contractors license in Virginia to do work worth more than $1,000. There are three classes of licenses, depending on the monetary value of the projects you plan to work on. You’ll need to complete a pre-license education course approved by the board. If you apply for a Class C license (single projects up to $10,000 and up to $150,000 per year), you must show two years of experience in the specialty you want to be licensed for. There is no state license in Washington. However, all contractor and specialty contractors must register with the Washington State Department of Labor and Industries. A handyman is considered a specialty contractor and is defined as someone who does minor work on existing properties worth a total value of under $2,000. This does not include work that requires a building permit and all work must be completed personally. To register, you’ll need to purchase a $6,000 bond and show proof of general liability insurance. The state of Virginia does not issue a specific handyman license or have handyman license requirements; however if you plan to do any work that is part of a project worth more than $2,500, but less than $10,000, you’ll need a contractors license from the WV Division of Labor. You will need to pass an exam and show proof of worker’s compensation insurance. To work as a handyman in Wisconsin you’ll need to hold a Wisconsin Dwelling Contractor Qualifier license, which is the contractor license that is issued to individuals. You’ll need to complete and pass a 12-hour course to be eligible for a license from the Department of Safety and Professional Services. You do not need a state license to work as a handyman in Wyoming; however, there may be local regulations which you need to check before you begin work. This information is provided as a service. To the best of our knowledge, it is correct and up-to-date; however, it is not to be taken as legal advice and you must always check with local authorities before making any business decisions. Requirements and regulations are subject to change at any time.